On January 9th, 2014, during the hearing at PERB in case # SACO 4645, CAPS President David Miller was asked why the organization’s Bylaws and Policy Manual were changed in 2011 and why they had been disregarded for over a decade. President Miller explained the changes were made to make the document clearer. When pressed on what clarity the board was trying to arrive at, Miller explained that it was “ridiculous” to hold regular annual membership meetings. He explained that member’s concerns could be freely addressed to the board at the quarterly executive board meetings in person, in writing, or via a district representative. If the leadership continues to play footsie with the Democratic Party (and in cases with the Republicans), giving gobs of our dues dollars to the candidates, the lobbyists and the lawyers while neglecting to build rank and file organization and democracy, the consequent defeat (in the upcoming negotiations) will drive Unit 10 members to seek alternatives and other organizational affiliations. To turn the situation around, CAPS must convene immediate emergency membership meetings at all campuses, form up action committees at each section and unit where Unit 10 members work and prepare united job actions to impress on HR how serious our members are. Without the serious threat of job actions by the membership our negotiators look like beggars with their hands out, rather than our true advocates convinced of the resolve of the membership and prepared to exert our collective strength. January 9th the Governor released his proposed budget and there were no raises for the Unit 10 rank and file indicated. Supervisors, on the other hand, found some indication that their pay parity concerns would be met. For the rank and file to win it requires that we act now to assure that the CAPS negotiators do not come back to us with a Tentative Agreement equivalent to the SEIU 1000 concessionary contract that gained only 1.6% per year, and which does not cover the losses to pension and medical insurance premium increases, and will leave many workers with smaller checks than before the furloughs started 4 years ago. Membership meetings are not ridiculous! Membership meetings are where members chart their course, develop strategy and organize the membership for action. What is ridiculous is the long-term failed strategy of the CAPS leadership, which has resulted in most Unit 10 members being 30% behind their peers in municipal employment and private industries. What is ridiculous is to think that a board that sequesters itself out of sight of the membership for decades, which demobilizes the membership, denies the members their rights, and is oblivious to the fact that most members hate the organization, can win us our long overdue pay parity. Rachlis went to PERB not only to get the second illegal expulsion expunged, but to learn from CAPS President David Miller the true belief of the current leadership-that worker’s democracy-that holding regular membership meetings is “ridiculous”! But if history is a guide playing footsie with the politicians will not win our demands; it will take a rank and file upsurge to win! Time is working against us but if CAPS acts now it could convene membership meetings at every job site next week and have informational pickets and press conferences across the state immediately in preparation for the negotiations. For Unit 10 to win pay parity the rank and file must run the organization themselves! In a sadly comic rendition of “We’ve got plenty of nothing” sung in three part harmony by the CAPS leadership, President David Miller sang back up for Blanning and Baker LLC. Partners (and CAPS Agents) Chris Voight and Matt Austin. They put on the old song and dance for a weakly attended (less than 10% of membership) pre-contract negotiations informational meeting in Richmond at the CDPH auditorium on June 4th. We will ponder the reasons for the weak attendance and offer a strategy for how State Scientists can gain pay parity, advancement opportunity, stable pensions and regular COLA’s after considering the strategy and tactics the President and the highly experienced Blanning and Baker team had to offer. After telling us what we already know: our pay and benefits are 30% behind both local county and city benchmarks, that the 3% “won” in the last contract barely offset the pension give back, they acknowledged that this years’ negotiations are all about the money; that we’ve been waiting for a long time, that we “shared the pain”, that we’ve done more than our share for this governor and then Voight lamented that we have a stingy governor . The following refrain was played over and again to a dwindling audience: You can help! Yes you can! Go to your managers, tell them to write the need for salary pay parity into the strategic plan, that is the only way it will go up through the chain of command of the state executive across to the legislative and create receptivity at the negotiating table. They then referred to sympathetic Branch Chiefs like Barbara Materna who favor pay parity, admonishing the membership to be proactive and shoot this concept up the chain of command. This ignores the fact that many at the level above the Rank and File are Unit 10 supervisors*, many of whom are voluntary CAPS dues payers and should have been pushing this up the chain of command, according to the Blanning and Baker theory, for over a decade now. Additionally, if this is the strategy of the CAPS leadership they wouldn’t just drop it haphazardly at an informational meeting. They are not serious about this kind of campaign because if they were, they would be writing and calling the membership about it, they would provide informational packages to create template letters and petitions and provide a structure to run the campaign, either on paper or online, creating a record of the struggle for pay parity. But they are not serious. They threw this sop out because they have nothing else to offer. With this game plan the blame for the failure is assigned to the membership. Their big negotiating ploy is to bring a young new employee to tell HR that he cannot afford to work for the State and if they do not fix the pay structure they will not be able to retain him. Blanning and Baker base this strategy on the false premise that HR cares if the departments fall apart. HR does not care; HR already knows. The Governor has drawn the line. Unions and programs that serve the people are on the chopping block. He is committed to imposing austerity at the expense of the state workers and the public who depend on state services. He will not be swayed by logic, mutual benefit schemes, or pleas from the underpaid. There is only one tool workers have which can win back what we lost and that is the All Public Workers Strike. To win, labor must also strike out independently of the bosses’ politicians and political parties, be they Democrats or Republicans and only run our own candidates in a workers party. CAPS members were solicited to send any relevant Pay Parity information (ads for comparable jobs) to the negotiating team. As benchmarks have been established for years, and considering that Blanning and Baker have staff already doing nothing for us, why don’t they run the Google searches for new employment and benchmark information? All this was a poorly presented song and dance obligatorily delivered without any pretense that CAPS (as organized today) can win! What they did not mention was: that they choose to give “this stingy governor” $53K in his election campaign, that CAPS supported prop. 30 and No on prop.32 with the highest per capita contribution of any state workers, that we dropped our fight for reimbursement for the illegal furloughs, that they forgot to say anything about when we would get the money for the 2 stolen holidays that we worked, or that lack of COLAS have impacted our purchasing power >20% over the past decade, or that by accepting a two tier medical retirement benefit a wedge is driven between the various tiered workers, or that they have been denying the membership democracy for over a decade, or that Blanning and Baker partners took no cuts during the furloughs, or that the membership is purposefully demobilized to keep the strategy of partnership with management in place, and to keep subsidizing politicians, lawyers and lobbyists, which ultimately gets us nothing but keeps the dues dollars flowing to the coffers of the Blanning and Baker LLC. partnership. Why then did this pathetic trio play to an empty opera house? Because the members have been alienated from their organization by design. We know their record, we know how they have done it, we know how they violated the bylaws and the promises to hold meetings and when the last real meeting was. We know and can show that their installation of officers has been illegal under the CCC. So who would want to go down the block to see these guys? What have they ever done for us? We know that our final pay it tied more to the SEIU 1000 contract than to anything Blanning and Baker and the CAPS leadership negotiating team will supplicate for at the table. Because all their strategies fail the workers, because they are never going to mobilize the membership and because they are in bed with management, the politicians and lobbyists, it is time for us to turn out the current leadership, fire Blanning and Baker LLC., and form a democratic union politically independent of the Democrats and Republicans. *For over a decade the plan for pay parity has ridden a one trick pony, to win parity first for the supervisors by forcing the executives hand in court which presumably would result in corresponding Rank and File raises although the logic of this assumption would escape anyone who has ever worked for wages. The failure and future of this strategy was not even addressed at the meeting. Without this plan Blanning and Baker alongside Miller were grasping at straws telling us to beg management to fight for us in the strategic plan! Is this a joke or what? BROWN DEMANDS A COST NEUTRAL BUDGET-READ WAGE FREEZE! CAPS LEADERSHIP IS NOT PREPARED TO WIN BACK WHAT THEY LOST IN THE LAST TWO CONTRACTS…LET ALONE MAKE PROGRESS. CAPS LEADERSHIP HAS NO WINNING STRATEGY. ONLY YOU CAN ORGANIZE TO WIN A FAIR CONTRACT. Their strategy is to depend on politicians, lawyers and judges instead of the rank and file. Their practice is to demobilize the membership, disassociate from the labor movement, to deny members their legal right to regular membership meetings and to illegally expel members who stand up for membership rights. They bet your pay parity on a failing decade-long show trial for supervisors pay parity! CAPS represent both management and labor in grievances! Like in a fascist union. How can CAPS grieve against your supervisor when your supervisors pay CAPS and are invested in CAPS winning pay parity? How can a worker expect CAPS to protect them from management when the supervisors pay CAPS voluntarily while rank and file must pay (at least) fair share! President Dennis Miller promised regular membership meetings in his 2011 campaign. Yet he continues to violate both California Corporate Code section 7510 and the CAPS 2007 Bylaws Article III Section 1 and the illegally updated 2011 Bylaws by refusing to convene regular membership (not just informational) meetings. The only meetings CAPS holds are informational-not regular membership meetings! PERB’s finding exposed CAPS leadership and Blanning and Baker LLC. to be scofflaws. The leadership illegally expelled Rachlis and illegally suspended Cosentino. The expulsion and suspension were overturned by PERB. CAPS LEADERSHIP THEN EXPELLED RACHLIS AGAIN! TWO TIMES IN 2012 ON TRUMPED UP CHARGES! REINSTATE RACHLIS! TURN OUT THE SCOFFLAWS! WE NEED REGULAR MEMBERSHIP MEETINGS RUN BY THE MEMBERS! WE NEED FAIR ELECTIONS WITHOUT CENSORSHIP! WE NEED A NEW STRATEGY WHICH DOES NOT DEPEND ON POLITICIANS, LAWYERS OR JUDGES, BUT ON THE MOBILIZED RANK AND FILE UNITING WITH ALL PUBLIC WORKERS TAKING JOINT ACTION TO WIN! TO WIN A DEMOCRATIC UNION AND A FAIR CONTRACT SCIENTISTS NEED TO INITATE UNIT TEN ACTION COMMITTEES AT EACH WORK PLACE! TAKE ACTION: JOIN THE INTER-UNION ORGANIZING COMMITTEE AND PROTEST FOR A FAIR CONTRACT AT NOON, JUNE 5TH, AT THE FRONT GATE! Answer: 2006 (but it was insufficient; it did not catch us up). Today your pay check buys only 3/4s of what it did in 2000! ASK: Why were the Bylaws changed in February, 2011? Answer: To deny members rights enshrined in the 2007 Bylaws for annual membership meetings. Rachlis revealed in Nov., 2010 that this right was being knowingly violated by Blanning and Baker LLC., the CAPS board and Gerald James Esq., for over a decade. Without the annual meetings the membership has been denied any semblance of democracy. The annual meeting was the only legal venue for installing officers and putting members concerns on the agenda or for addressing the assembled membership. Thus all officers elected for over 12 years now were not legally installed and all their actions have been illegal. This denial of regular meetings is a denial of CAPS contractual duty (based on the dues for bylaws exchange) to the membership and is thus the basis for the 15 million dollar theft of services charge against Blanning and Baker. ASK: Why did the new Bylaws eliminate the annual membership meeting? Answer: Because Rachlis exposed the leadership for not holding legally mandated (CCC & bylaws) annual meetings. ASK: When was the last regular membership meeting? Answer: Over 12 years ago. Disregarding the Bylaws and CCC, members have been denied an annual regular membership meeting for over a decade. ASK: Why are members not allowed to hold and run their own regular meetings? Answer: Because Blanning and Baker LLC. don’t want the membership to control their own organization. They like keeping their fingers on the purse strings. ASK: What is Blanning and Baker LLC. (the CAPS agents.)? Answer: It is not a law firm as members have been led to believe. It is a Labor Consultation firm. Their project is not to make you money but to make money for their partnership! Their method is schmoozing with politicians and keeping you under control. ASK: Why do we need a profit making labor consultant to run our affairs? Answer: Considering their track record, we don’t! Answer: Only if a rank and file slate with a class struggle strategy and program runs for office and wins, removes Blanning and Baker LLC. as agent and charts a politically independent course of action based on a mobilized membership. ASK: What can I do? Answer: Form Unit 10 action committees, talk to other Unit 10 members and listen to their experiences with failed representation by Blanning and Baker LLC., and discuss the failed CAPS steward system. Run for office to replace the entrenched team, remove Blanning and Baker and reclaim CAPS for the rank and file of Unit 10. The Unit 10 Action Committee met on 5/21/13 and adopted the following principles and demands both on the State and on ourselves/our organization. We will build the action committee at the CAPS informational meeting on June 4th. We will build for inter-union solidarity action to win back what was taken from us in the last contract on June 5thduring lunch at the front gate of CDPH in conjunction with labor demonstrations in Sacramento. 1) Turn CAPS into a union run by the democratically organized, mobilized and assembled rank and file. 2) For political independence of labor. Fund only labor candidate. 3) Unite with workers organizations (public & private), employed and unemployed, to defeat the austerity and win a fair contract. 4) Run candidates committed to political independence, to class struggle tactics, based on organizing, assembling and mobilizing the membership to develop and struggle for their own program. 4) NO GIVE BACK OF HOLIDAYS! Holidays were accepted years ago in exchange for wage demands not granted, PDD’s were granted after they stole 2 holidays. 5) Make up pay for increased worker contribution to medical and pensions. 7) Overturn new retirement requirement. Pits new workers against old workers. No two tier system. Equal benefits for all! No extended vestment periods. 1) Hold regular membership meetings, not informational meetings. 2) Regular meetings at every job site (monthly or quarterly, more often in lead up to contract talks), linked by web for broadest democratic discussion. 3) Initiate CAPS members e-forum for democratic discussion of the membership. 4) Build unity with the broader labor movement for actions against the austerity. 5) Organize the unorganized. End contract labor. Defend the contract workers. Demand equivalent service time and state jobs for regular contract workers. 6) Supervisors out of the union. 7) For an active steward system that communicates, mobilizes and defends the membership. 8) Elevate the strategy of membership mobilization and assembly over that of lobbying and lawsuits. SET UP CONTRACT ACTION COMMITTEES AT EACH JOB SITE NOW! CAPS LEADERSHIP AND BLANNING AND BAKER HAS NO STRATEGY TO WIN! As our contract period comes to a close the Miller/Valez leadership has done nothing to prepare the membership for the contract fight. They continue to believe that their “Chump change” contributions to the Democrats ($1,000 per head to assemblymen and senators) and $53K to the Brown Campaign will buy the influence needed to navigate the upcoming contract negotiations. Indeed it will, if you don’t put COLA’s on the agenda, if you don’t demand make up pay for additional contributions to medical and pension, if your not serious enough to really fight for pay parity then the current conciliatory leadership will skate through just fine! They will say the negotiations were tough but they did the best they could and come out with something similar to if not less than what SEIU gets! The membership will fall further and further behind. BUT THIS DOES NOT HAVE TO HAPPEN! These leaders gave up three years of furloughs without a fight despite happily funding their lawyers and agents payroll! The current leadership does not prepare scientists doing the states work for this contract and in so doing they prepare for defeat. To win we must set up contract action committees at each job site develop our demands by democratic discussion among all rank and file scientists both locally and coordinated state-wide then we must vote down anything short of what is develop in democratic rank and file meetings. CAPS LEADERS HAD THEIR CHANCE TO HOLD REGULAR AND LEGALLY MANDATED MEMBERSHIP MEETINGS BUT THEY HAVE REFUSED FOR OVER A DECADE! THEY ONLY HOLD IRREGULAR AND INFORMATIONAL MEETINGS NOT TRUE MEMBERSHIP MEETINGS! THIS IS A VIOLATION OF THE BYLAWS AND CALIFORNIA CORPORATE CODE. Since this statement (see post above) was sent to a small list of Unit 10 workers, the room was booked and the leaflets were posted. Since then the profit takers of Blanning and Baker have been working overtime to protect their profit center (CAPS) from cutting them loose and running their own affairs. To prevent democracy from breaking out in unit 10 they have gone to management to force facilities to prevent the rank and file scientists from holding their own meetings in a facility room despite the fact that Blue Shield, Scientific equipment vendors, Toast-Masters, SEIU, Weight-Watchers etc all use facilites with no charge and no objection. THE ONLY PEOPLE NOT ALLOWED TO USE FACILITES ROOMS ARE THE RANK AND FILE WORKERS IN THE FACILITY! THIS ATTEMPT TO CONTROL THE WORKERS BY BLANNING AND BAKER AND THE MILLER/VALEZ TEAM IN COLUSION WITH MANAGEMENT IS A VIOLATION OF WORKERS DEMOCRACY. This behavior shows exactly how the CAPS leadership is working hand in hand with management to prevent the membership from meeting and charting a democratic course forward into the contract negotiations. Rank and File Scientists will hold our meeting on Tuesday May 7th. It may not be in C-140 as originally planned, it may be in a Cafeteria, in the hallway, on the lawn directly outside the Auditorium at C building, in the picnic area waterfall of building P or another place of our choosing. For information come to C-140 or check the break room near your work area. 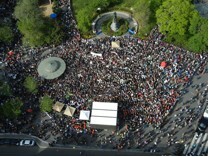 Union members met on May 1st 2012 before marching down Broadway to City Hall. For Matt Austin this is a no…no! On April, 30th Matt Austin, Blanning and Baker partner and agent for CAPS scabbed against the rank and file by demanding that management stop Unit 10 Rank and Filers, CAPS members, expelled CAPS members and contract scientists at CDPH from holding an organizing meeting. But the workers of CDPH prevailed, WE WILL HOLD OUR MEETING! We will discuss how to win a fair contract and build a democratic union. As ever Matt Austin is responsible for attempting to prevent CAPS members meeting. Not that he is the only one to prevent CAPS members from meeting, but he is always one of those who do! Each and every time he is always one of those who do. 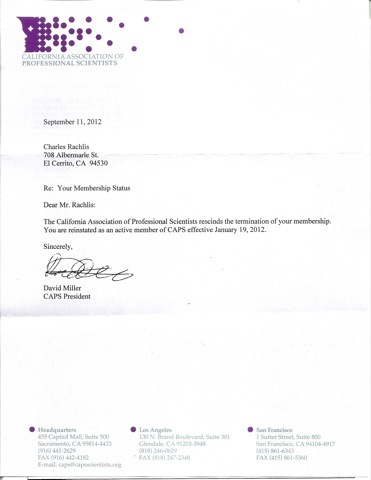 CAPS president David Miller promised in his election campaign literature that he would hold regular membership meetings. But the real power controlling CAPS, Blanning and Baker LLC., will put up with none of that! CAPS has not had a legally mandated regular membership meeting in over 12 years! And we’ve seen neither hide nor hair of David Miller or Matt Austin at the CDPH laboratories since long before the election. Labor organizations, or any organization that is not a fiction holds regular meetings. Does CAPS hold regular membership meetings? NO! Well we are going to hold a meeting. We call on state scientists to initiate job site meeting across the state! Organize the contract workers make a state service union wall to wall! President Miller plays footsie and poses regularly for photos with Democratic Party politicians (see back page pictures in the CAPSULE.) But he runs from convening regular annual CAPS membership meetings because the leadership is afraid the membership will build a democratic union a throw out the parasitic labor leaches those corporate profiteers Blanning and Baker LLC. BREAK WITH THE NO GOOD-FAITH, NO WIN DEMOCRATIC PARTY STRATEGY! CAPS gave Brown’s Campaign 53K then he prolonged the illegal furloughs then imposed Schwarzenegger’s concessionary contract on us! CAPS leadership caved in without a fight! STOP FUNDING THE BOSSES POLITICIANS! BREAK WITH BROWN AND HIS AGENTS! As the current contract comes to a close we have to consider if the current leadership is capable of leading Unit 10 to win back what their failed policies have lost us already. In order to win in the next contract negotiation we need self-organization of the membership. We need regular membership meetings to prepare our demands and our strategy to win. We will need to convene unit 10 rank and file membership meetings in each job place to build democratic input into the negotiating process. The Fighting Union Caucus asserts that the current leadership has no solutions, can not win what it has lost, that it refuses to fight for the membership and thus needs to be removed if we are to win a fair contract. We need to look at how CAPS is run, how come we don’t have our own offices, our own phones, our own meetings, how come there are supervisors in our union, how come we have not had a COLA that keeps our purchasing power equivalent to that of 12 years ago? We will ask who profits from our dues dollars? We have discovered that profiteering corporation which runs CAPS and PECGS Blanning and Baker LLC and their empire makes millions off of California public workers dues dollars and delivers nothing. We will look at the relationship of Blanning and Baker to the lobby firm and labor consultants Aaron Read & Associates and at Bruce Blanning’s daughter’s policial consulting firm, Gilliard Blanning and Associates which promotes Republican candidates. We will consider the basis for Blanning and Bakers insistance at keeping non-rank and file supervisors in our organizations. We notice this allows the use of the supervisors (as adjunct CAPS members) to manage the contractors who do Unit 9 and Unit 10 members work. We assert that grievances between rank and file and their direct supervisors are not fairly grieved by our representatives at Blanning and Baker, because they favor the supervisors (who voluntarily contribute to the “union”) over the rank and file who are obliged to pay ‘fair-share’. We will ask the hard questions. How can the rank and file expect a profit taking firm to organize scientists and engineers to defend our wages and benefits while they promote in-sourcing and allow union members to manage them? We will ask hard questions like how come Blanning and Baker partners profited while we were put on furlough and our wages and benefits were rolled back and have stagnated? We will ask hard questions like what has Blanning and Baker done for you lately? We will ask why have over 400 PECGS engineers left PECGS and why are they currently suing Blanning and Baker in Court? We will ask why did Blanning and Baker get a 5% raise from PECGS and did CAPS give them a raise also in 2012? We will ask how come current CAPS president David Miller promised to hold regular annual meetings two years ago when he ran for office and is yet to convene a single meeting? We will ask what kind of union denies its members the right to meet each other in regular membership meetings for over 10 years? We will assert that this is not a workers organization, not a union but a profit center for Blanning and Baker LLC. We will answer why CAPS candidate for VP in the last election was expelled twice in one year. We will explore how the PERB decision reinstating the expelled member proved the CAPS leaders and Blanning and Baker to be scofflaws who trample on the rights of members. We will promote the self organization of the membership and united action with members of Unit 10 with our co-workers in Unit 9 to expose the profit takers, drive them out of our organizations and rebuild democratic representation for our rank and file which can establish fighting unions to defend our interests. 1) The ossified self perpetuating CAPS board works obediently to maintain the subservience of CAPS to its agents (the labor profiteers at Blanning and Baker LLC,) Democratic and (on occasions) Republican Party politicians and ultimately the ruling class which profit by the demobilization of organized labor. 2) By denying members their right to annual/regular membership meetings, under California Corporate Code and under the 2007 CAPS Bylaws, for over ten years many members of the current board have participated in an ongoing theft of services. The bylaws (literally second law) are a contract between the members and the organization; the members pay dues dollars and the organization is obliged to follow the bylaws. Yet CAPS denied members their right to annual membership meetings for over 10 years and when I brought it to the attention of the board in a November 2010 letter, the board under the guidance of B&B wrote our right to an annual membership meeting out of the 2011Bylaws. This may come as a surprise to CAPS but as far as I have been able to ascertain only corporate, fascist, and business unions deny their members the right to hold regular meetings where the members can discuss the business of the organization. 3) Adherence to the Bylaws and Policy Manual (PM) is not the practice of this leadership. Had it been, CAPS would have held regular/annual membership meetings for the last twelve years (where members’ agenda points can be put before the entire membership,) Rachlis and Cosentino would not have been illegally thrown out and the CAPS leadership team would not have lost to Rachlis in the PERB decision # HO-U-1064-S which required CAPS to reinstate Rachlis retroactively to the date of his expulsion. Playing fast and loose with the rules, are lawyer’s games and they may work to control and organization but they come at the expense of worker’s democracy which is systematically denied. 4) The failure of the CAPS/B&B leadership team to deliver on the economic front and the ongoing denial of members rights has created a breech between the leadership team and the rank and file of CAPS. By refusing to hold regular meetings CAPS leadership assured that the B&B method of filling the politicians campaign coffers with our dues dollars, and the filling of the partners of B&B’s retirement funds with millions from State Workers dues dollars would not be challenged by any attempt to mobilize the membership around a winning strategy and tactics similar to that which worked for the Chicago Teachers last month, and the Marikana miners last week. Indeed the lack of workers’ democracy, the failure to take workers’ side in grievances with management, the multiple denials of legal counsel by B&B for workers attacked by management has left the rank and file with the feeling that CAPS/B&B work hand in hand with management instead of working for the members. This is why an opposition slate running, of relatively unknowns, despite censored campaign statements and limited access to the ear of the membership won 25% in the last election by running on a class struggle-action program. This type of rank and file response to such a campaign is unheard of in recent labor history. Indeed the fact that the CAPS-Fighting Union Caucus (CAPS-FUC) won 25% in the last election has the ruling clique running scared and for that reason B&B’s stooges have launched a smear campaign to drive me out of the organization. Miller/Chatsworth-Brown in their grievance of September 19, 2011accused us of running a campaign for the decertification of CAPS (which was not true then and is not true now) but consider the implication that if it were a campaign for decertification and 25% of the members voted for it B&B’s profit taking days and failed methods would clearly be numbered. 5) The current leadership team employs the so-called team concept of labor management relations assuring the supine obsequiousness of labor before management. This method has left the membership with declining spending power for our shrinking dollar (uncompensated for by COLA’S), cuts in hours and wages due to two years of furloughs and two years of PLD’s, increased employee contribution to medical, to pensions, we lost holidays and have suffered increase of supervisory harassment, as well as racial, ethnic, age and gender discrimination expressed through arbitrary application of unreasonable work and reporting rules. The membership, 2/3’s of which did not vote in the last election and of the remaining 1/3 who voted 25% voted for the opposition, is clearly not inspired by the leadership which reigns by the combination of inertia and denial of workers’ democracy. 6) Budroe bases his grievances on a ‘damning’ blog post at http://wp.me/p1OGRw-2Y published on August 25th (while Rachlis was still expelled) and claims it violated the PM’s rule against advocating for decertification. The MDRC must reject this. 7) Budroe twists and misrepresents the meaning of the statements made in the ‘damning’ blog post. The following quote is lifted directly from the blog. We have highlighted key controversial phrases and will comment on their meaning further below. 9) Budroe and the CAPS /B&B leadership team flummoxed from their defeat at PERB again overstretch the limits of logic as they try to fit a square peg in a round hole; the statement reproduced above is merely a statement of facts. The facts are: there is no internal democracy in CAPS, the organization has illegally expelled me and illegally suspended Mr. Cosentino (thus establishing a track record as scofflaws) in turn it is reasonable for members of units 9 & 10 to consider that in order to establish democracy in our organizations B&B’s contract must be severed and to accomplish this objective necessity, internal remedy mechanisms may not be adequate. May is used while expressing possibility as in “It may rain this afternoon.” That it may not rain this afternoon is unstated yet implied by the very nature of possibility. The statement from the blog reprinted above merely states a possibility, something scientists are often known to do; we call it stating a hypothesis. 10) The recent denial of democratic procedure and other failures of the leadership indeed put new weights on the scale; commenting on this fact is not an indictable violation of the PM. Indeed I am not alone at weighing the options before CAPS. And there is no statute in the Bylaws or PM that denies members the right to talk about or write about weighing options. Weighing options is not the same as choosing options. Contrary to its own intention by expelling Rachlis twice in one year the CAPS board would be putting more weight on the scale that the membership is currently looking at. 11) Budroe claims that our blog posting makes it clear that we do not advocate ‘reform from within’ and that rather we call for decertification. Again the enmeshment between the entrenched and ossified leadership of CAPS can not disassociate itself from B&B. The ‘damning’ blog stated “Today we are convinced that CAPS can not be reformed without getting rid of B&B”. Without overstating the obvious we do not see the contract between CAPS and B&B as carved in stone-it must be renewed on a regular basis. The CAPS relationship with B&B is based on a contract that the CAPS membership can, if it so chooses, not renew! This would open the road to reform of CAPS and would shift the weight on the scale toward the possibility transforming CAPS into a fighting rank and file class-struggle organization. 12) We’re not lawyer pussyfooters. If we wanted to call for decertification there would be no question about the language. It would be unambiguous and our whole record of the CAPS Fighting Union Caucus (CAPS-FUC) demonstrates this. 14) It is time for CAPS to begin to function in a democratic manner and stop its illegal denial of membership rights and this witch hunt against members who demand our rights be respected. If the MDRC reduces itself to the level of a kangaroo court dutifully and uncritically participating in the Budroe witch hunt, a witch hunt which began with red baiting by Matt Austin in Superior Court, was followed up with addition red baiting by Budroe and Miller during the campaign last year and was reintroduced in the Miller/Brown grievance of September 19, 2011, then this august body will itself be soiled by its actions reducing its respectably in the world of adjudication one akin the McCarthyite House Un-American Activities Committee, the Spanish Inquisition, and the Moscow show trials which sentenced the best working class militants of the 20c to death. 15) In conclusion the MDRC has a choice. You can expel Rachlis on false charges and further expose the undemocratic nature of CAPS. This action would confirm for many that CAPS is not Workers’ Organization but is truly a captive corporate controlled union reduced to being nothing more than a profit center for B&B and the dutiful enforcer of the capitalist austerity on the backs of the workers of unit. 10. Or you can reject this witch hunt and open the road to workers democracy in our organization. The following letter was sent to the board of CAPS on 09/14/12. Find attached and in the e-mail below a grievance filed by Charles Rachlis against David Miller and Patty Velez on January 9th 2012 for violation of California Corporate Code and denial of members rights to examine and copy the membership list (http://wp.me/p1OGRw-21.) To our knowledge the Membership Disciplinary Review Committee (MDRC) ignored and took no action to adjudicate this grievance, neither has the MDRC made any report to the membership on the submittal of this grievance, nor have they responded to the author of the grievance. This lack of action on the part of the board and the MDRC stands in violation with the rules (bylaws and Policy & Procedures Manual) of the organization and thereby denies members just rights. This grievance was submitted prior to the illegal Kangaroo court which expelled Rachlis and suspended Cosentino. The leadership acting under the inept guidance of councel provided by Blanning and Baker LLC, Gerald James Esq. and Lisa Crevich Esq., decided to place this grievance in the circular file. I demand that the CAPS board remove David Miller from the role as chair of the MDRC. I demand that the Board convene a meeting of a new MDRC to address the violation of memberships rights by the last seated MDRC which was convened to adjudicate the Miller/Brown v. Rachlis and Miller/Brown v. Cosentino grievances. I demand that the new MDRC address the violations of members rights carried out by the MDRC convened under the Chair of V.P. Patty Velez. This new MDRC must address the grievance (see attached) submitted on January 9th 2012. As that Charles Rachlis has had all rights of membership restored by the finding of illegal activity on the part of the MDRC/CAPS by PERB I demand the board assure those rights are respected and the grievance submitted on January 9th, 2012 be fairly adjudicated by an impartial MDRC without interference from the Blanning and Baker LLC, or any of the members who sat on the previous MDRC. CAPS is organized as a mutual benefit non profit corporation which must abide California Corporate Code. CAPS must provide a venue for membership to convene a special meeting. That venue is provided pursuant to CCC and outlined Bylaws Article III Section 2(a); in which, a members’ right to petition the membership to hold a special meeting is enshrined. In order to reach the membership for the purpose of distributing the petition, a list of the members’ names addresses and voting rights must be made available with in ten days of demand. Due to the actions of President David Miller and Ex President Velez CAPS stands in violation of CCC 8330. Their reckless disregard for the law under which CAPS is mandated to function opens the organization to liabilities for denial of services, theft of dues, and denial of dues payers rights. According to the by-laws I need 5% membership signatures to call for a special membership meeting. I would like to circulate a petition to call for a special membership meeting. To do so I will need the list of the membership including their e-mail addresses, home addresses and phone numbers as is my right according to California Corporate Code which governs Mutual Benefit Non Profit Corporations such as CAPS. Please submit the list to this email address or let me know when I can pick it up at the CAPS office in San Francisco. I can be at the office this Friday at 11:00 does this work for you? President David Miller responded on behalf of the current board and refused to comply with California Corporate code thereby making it impossible for me to reach the membership to gather a petition to hold a special membership meeting. See David Millers’ e-mail of December 29th, 2011. You have requested that CAPS provide you a “list of the membership including their e-mail addresses, home addresses and phone numbers”. I respectfully deny your request. I have instructed CAPS staff provide no such list to you, or to anyone else. The CAPS Board is aware of your request and my response. In a follow up e-mail I asked how to go about petitioning the membership as is our right. No response has been received to date. Please explain how a member is to petition the membership to convene a special meeting of the organization without a way of knowing who the members are. Refusal to abide the CCC 8330 is violation of the law as enforced by the attorney general of the state of California. The Membership Disciplinary Review Committee may review the law below. For violation of members’ rights, for violation of the bylaws, and for violation of CCC in the name of CAPS we request that David Miller and Patty Velez’s membership in CAPS be terminated. of which the list is to be compiled. related to the members’ interest as members. Members want to know how much money was wasted in the illegal harassment of Rachlis and Cosentino? How much did CAPS pay the lawyers during the Kangaroo court illegally convened to expel Rachlis and Cosentino? How much was spent paying for E-Board members to convene the Membership Disciplinary Review Committee which illegally expelled Rachlis and Cosentino? How much was spent on lawyers and e-board members per-diem to defend their illegal actions infront of the PERB board? Members want to know how long we must endure the guidance of the Profit Takers of Blanning and Baker LLC. whose incompetent legal team allowed the e-board to harass and expel Rachlis and Cosentino! WE DEMAND THE IMMEDIATE REINSTATEMENT OF GIORGIO COSENTINO!